Long time, no squee, but you'll forgive me. Right, dear reader? So, what have I been reading? 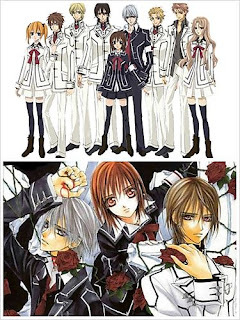 Vampire Knight of course, in English and horribly in Japanese. Seriously, you cannot go wrong with teen vampires, high school, and angst. Cross Academy has two classes, a day class and a night class. Watching over them are Professor Cross and his adopted children Yuki and Zero. Professor Cross used to be a vampire hunter, but now he is a self described pacifist who wants unity between humans and vampires. Zero is a vampire hunter who is also a self-hating vampire. Yuki is just a regular girl; well, her entire family was slaughtered by vampires, but that was years ago. Also in the mix is Kaname, a powerful pure blood vampire who is president of the night class. There is a bit of action, but the main tension exists in the "love triangle" between Zero, Kaname and Yuki. Zero wants both to die and to live to protect Yuki. He also commits the forbidden act of drinking her blood and later Kaname's blood to keep from falling into the madness. Unlikely vampires are tortured souls and Zero is the most tortured of them all. Contrast him with Kaname who was born a vampire into a pure blooded vampire clan. He's pretty damn swass. In the center is Yuki, who lost her family to evil vampires but is in love with Kaname and Zero. Kaname wants to make her into his vampire lover. Zero would rather die than see that. What choice would I make? Hmm. It's like the choice between loving free market capitalism in all it's glory or throwing your chips in with a depressed junkie who will die a horrible death. Hmm. Zero has an awesome tattoo on his neck and a neat vampire hunting gun. I guess I would take him. What I like about this manga is that it has adequate amounts of wind and angst. No angsty manga is complete without wind. It sweeps through everything perfectly framing all of the characters. Kyo Kara Maoh is coming out slowly in manga form. It's great fluff, and of course I love it.